Over 60 per cent of young people in Sierra Leone are unemployed or underemployed. The lack of prospects -one of the principal causes of the civil war- is still considered a major threat to peace and stability. Youth employment is a source of great economic potential. Yet in the twelve years since the end of the armed conflict, the country´s production and employment potential has still not been fully tapped, especially in the rural private sector. Skilled workers are in short supply. After a decade of civil war and poor government funding, the education situation also remains inadequate. Around half of the population is unable to read or write. Without needs-oriented training and practical work experience, it is difficult for young people to find productive employment. Since ten years, the project aims to improve the employment and income situation of young people in rural areas of Sierra Leone in three districts. In order to increase employment opportunities for young people, the private sector must be revived and strengthened. The greatest development potential is offered by the agricultural sector as one of the primary economic sectors; at present, however, it is inadequately geared to the market economy and securing the livelihoods of the citizens. Using a multilevel approach at the target group level, the activities focus on creating jobs and income thorugh the Output ´Youth are qualified for self and wage employment in and around the cocoa/coffee, rice and small ruminants value chain´. 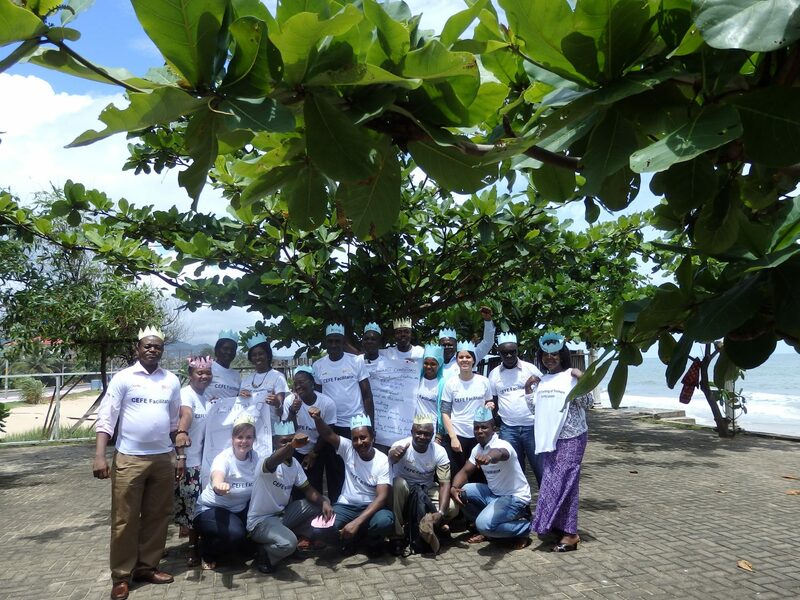 To support the projects´objective CEFE International prepared and carried out a 12-day Training of Trainers in Freetown, Sierra Leone. The master trainer and the assisting trainer led the execution of the training, which includes the preparation of the programme outline and training material / Further, CI supports GIZ a grid for the selection of ToT participants / Based on the experiential learning experience the ToT participants conducted exercises independently (Macro-laboratories). They were accompanied by the trainers and received intensive feedback during the ToT. After the seminar day, CI assisted the participants in their course preparation for the next day. CI evaluated ToT participants according to comprehensive procedures and tables for participants’ assessment and scoring. Evaluation criteria include training skills, technical know-how in entrepreneurship and quality of contributions/ In teams of not more than four persons working together, the trainer group was supervised by one coach. The trainer team had the possibility to run a CEFE course for at least 5 days (or minimum 35 hours), whereas each trainer had to conduct at least four exercises. Therewith, around 500 youths have been trained in entrepreneurship by certified CEFE-trainers.